ALGIERS (Reuters) - Algerian President Abdelaziz Bouteflika, who is now expected to resign this month after resisting weeks of protests, established himself by ending a ruinous civil war but came undone over corruption and economic stagnation. 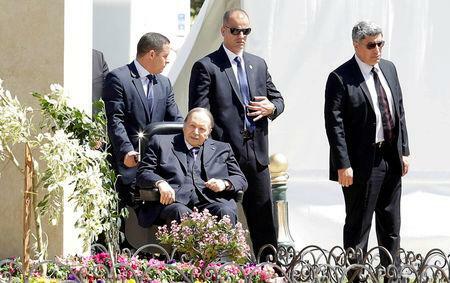 Bouteflika, 82, a veteran of Algeria's war for independence, has rarely been seen in public since a stroke in 2013 but held out despite mass demonstrations against his two-decade-old rule. He had sought to fend off the wave of dissent that began on Feb 22 by reversing his decision to seek a fifth term. But he did not say when he would go, further angering protesters. In a report on Monday, the APS news agency also avoided mentioning a date, but said Bouteflika would leave before his term ended on April 28. Two private TV channels said on Sunday he could step down this week. A fighter in the 1954-1962 war to end French colonial rule, Bouteflika became independent Algeria's first foreign minister and one of the forces behind the Non-Aligned Movement that gave a global voice to Africa, Asia and Latin America. He welcomed Che Guevara, and a young Nelson Mandela got his first military training in Algeria. Black Panther Eldridge Cleaver, on the run from U.S. police, was given refuge. Cleaver held court in his Algiers safe house with Timothy Leary, the drug-taking high priest of U.S. counter-culture. By the end of the 1970s, though, Bouteflika had fallen from favour at home and went into exile. He returned to public life when Algeria was being ravaged by a conflict with Islamist militants which killed an estimated 200,000 people. First elected president in 1999, he negotiated a truce to end the fighting and wrested power from the secretive military-based establishment known as "le pouvoir" (the powers-that-be). Helped by oil and gas revenues, Algeria became more peaceful and richer. But it remains mired in corruption and political and economic torpor in a region where uprisings brought changes in neighbouring countries. The invitation to Arafat to address the General Assembly was controversial. Only two years before, Palestinian gunmen took hostage and killed members of the Israeli team at the Olympic Games in Munich. Bouteflika watched from the chairman's dais as Arafat, a gun holster on his waistband, addressed the assembly in New York. When pro-Palestinian militant Illich Ramirez Sanchez, better known as "Carlos the Jackal", kidnapped oil ministers from an OPEC meeting in Vienna in 1975, he demanded to be flown with his hostages to Algiers. Bouteflika was shown on camera embracing Carlos at the airport before they sat down to negotiate the hostages' release. When Boumediene died in 1978, Bouteflika lost his mentor. He was replaced as foreign minister and an investigation was launched into financial impropriety. Bouteflika said the allegations were invented as part of a political plot. He left Algeria in the early 1980s and settled in Dubai, where he became an adviser to a member of the emirate's ruling family. He returned home in 1987 but kept a low profile, refusing offers of government posts. In the meantime, Algeria was unravelling. The military-backed government annulled a parliamentary election in 1992 that Islamists were on the verge of winning. In the conflict that followed, whole villages were massacred and civilians walking in city streets had their throats slit. He won re-election in 2004 and again in 2009, although his opponents said the votes were rigged. Through a series of ferocious turf battles with his security forces behind the scenes, Bouteflika had, by the start of his third term, become Algerian's most powerful president in 30 years. Bouteflika said in a speech in Setif, in eastern Algeria, in May 2012 that it was time for his generation to hand over to new leaders. "For us, it's over," he said.